So what’s included in the closing costs? And how do you calculate your cash to close? There is a ridiculously long list of potential fees that you may pay to get your mortgage. Below is by no means an exhaustive list, it’s just the major points. Whether or not you are responsible for certain things depends on the type of loan you get & where you are purchasing, but you can expect to pay almost everything listed below. This is paid to the appraisal company to estimate the value of the home. It’s required by the lender. You can’t get far without this, it’s a cost of doing business. It’s worth noting that you’re also not allowed to pay for the appraisal directly. To avoid potentially influencing the appraisal, the lender collects payment from the borrower and passes it along to the appraiser. You can learn more about home appraisals here. Some lenders charge you for this, others don’t. It’s usually less than $20, but another cost of doing business. This can fluctuate wildly based on the purchase price, but it’s essentially the fee paid to the title company, escrow company, or attorney who is the independent third-party completing the transaction. These fees pay for the title company to search historical records and ensure the person selling you the property actually owns it. After the search is complete, lenders require the purchase of insurance in case the search is wrong and someone manages to sell a house they don’t own. The loan is secured by the property itself, if you don’t own the property that’s a problem! Thankfully this is a one-time cost. In the same vein of title insurance, you need to insure the home. If the place burns down and it’s uninsured you suddenly have a mortgage payment, no place to live, and no cash to rebuild. Unlike title insurance, homeowners insurance is paid annually or semi-annually. In many cases it can be impounded and included as part of your mortgage payment. Property taxes are a funky beast (not in the cool way like Travolta in Saturday Night Fever, or Travolta in Pulp Fiction, or really like Travolta at all.) Property taxes are paid in varying ways – sometimes quarterly, bi-annually, or annually. Because of this, the person selling you the home may have paid property taxes in advance, in which case you have to repay them. Other times, they may not have paid yet, in which case you’ll have to split the fees. All this needs to be settled during escrow. Loans can close on any calendar day. Sometimes there’s a small interest payment due to shore up any interest accrued through the first of the month. In many cases, your escrow will include your first month’s payment as well. Also known as “Origination Fees” or “Lender Costs.” Outside of your down payment this is probably the biggest fee in your closing costs. Lenders need to make money in this process, otherwise they wouldn’t exist (and we’d all have to go back to paying cash upfront). This fee can add up to thousands of dollars depending on the price of your home. With the new Loan Estimate form, it’s easy to see these fees (under “Closing Costs Details” in Section A.) However, lenders will work with you here, these fees are often negotiable. 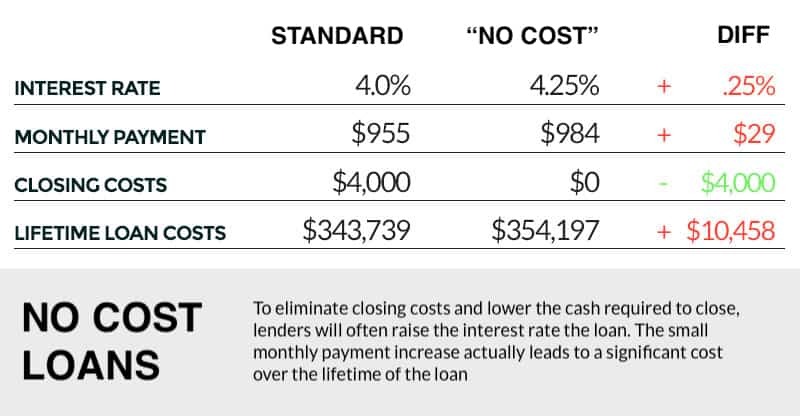 Cash-strapped buyers have another option when it comes to lender fees – the “no-cost” loan. This name is incredibly misleading, because there is definitely a cost to it. In these cases, the lender is just financing the closing costs, they do this by increasing the loan amount or interest rate associated with the loan. In exchange for paying no lender fees, the borrower agrees to a higher than market interest rate. This allows the lender to recoup the fees when they sell the loan on the secondary market, making their profit from the investor instead of the borrower. However, this translates to a higher monthly payment for the borrower, so you’re really just paying this fee (plus some!) over a longer period of time instead of upfront. Depending on how long you keep the loan, this may or may not work in your favor. Nothing is free in life, at best the “no cost loan” is a misnomer, at it’s worst it’s incredibly misleading. Depending on how long you keep the loan, this may or may not work in your favor. For the scenario above, the breakeven point is 11.5 years – refinance or sell before that, and the borrower ended up paying less than they would have up front. If they waited longer than 11.5 years, they paid more then the $4,000 required at closing. No cost loans are a viable option for many, and in today’s low interest rate environment, having to use one is not the worst thing that could happen. This is money that you pay up front as part of the home purchase. This can be anywhere from 0% in certain scenarios all the way up to 25%+. There are many loan products that account for borrowers with limited cash for a down payment, lenders are often far more accommodating than most people think. However, because the borrower is putting down less cash, the loan is considered more risky, so you end up paying more in the form of mortgage insurance. It’s also worth noting you can receive grants or other types of down payment assistance to close your loan. There are many different state and federal programs, it pays to do your research here! Also called a “good faith deposit”, this is money the home buyer puts into escrow at the time the offer to purchase the home is accepted. This deposit is usually defined in the purchase contract and is negotiable, but it often comes to 1-3% of the total home value. Calculating your cash to close is fairly simple. It’s your down payment plus all closing costs, minus any earnest money deposit that has already been paid to escrow. This amount should be clearly presented on the closing disclosure for your loan, which the lender is required to give to you a few days before your loan closing. There are also edge cases where financing your closing costs or going with a no cost loan can work in your favor. Say you have saved 11% of your home value – instead of putting 8% down and paying 3% in fees, you may be better off with a no cost loan & increasing your down payment, reducing the amount you pay in mortgage insurance. This is where your loan officer should be able to provide some guidance. If you’re trying to work through your options, you can check out this loan comparison tool. A final note on the cash required at the closing table – often times it can come from many different places. Sometimes borrowers will require the cash from an existing home sale. Others may liquidate stocks & bonds, or take advantage of their IRA and withdrawal the money without penalty. It’s important to let your lender know you plan on doing this ahead of time. 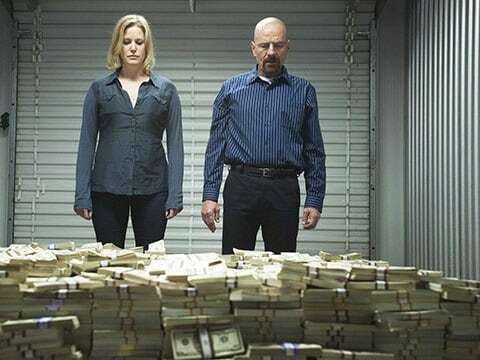 Large amounts of cash coming in and out of accounts can spook lenders, it can make you look like a drug dealer or some other nefarious person laundering money. Best case scenario they’ll make you write and sign a letter explaining the transaction. Worse case they refuse to do the loan altogether. Whenever you can, liquidate any assets you plan on using for the purchase as early in the mortgage process as possible to avoid any headaches.